Gift of Mr. Ralph Friedman, 1988. Ruth E. Friedman, New York; gift of Mr. Ralph Friedman in 1988. Ms. written and illuminated in Florence, Italy, 1470-1480. 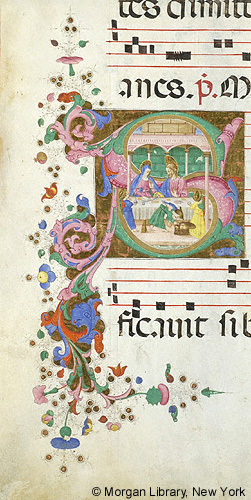 Decoration: 1 historiated initial S with Christ and the Virgin seated at table, tended by three angels, the Marriage at Cana? Artist: initially attributed to Ricciardo di Ser Nanni; attributed by Albinia de la Mare 7/26/91 to Antonio de Niccolo di Lorenzo..